I did not have a pleasant experience watching this movie; nothing to do with the actual movie, but because of the audience I was unfortunately seeing it with. Picture the scene; there’s a new horror movie that’s the latest entry in one of the most famous horror series of all time, and it’s showing at a late-ish screening in a West End cinema on a Friday night. Now, that is going to draw quite the crowd of people wanting to pay top dollar for a ticket at this central London venue, but I just so happened to be amongst the kind of crowd that would never stop talking all the way through. Seriously, from the moment the BBFC title onwards these people were chatting, browsing their phones, and moving seats closer to the front, all while everyone else was trying to pay attention to the movie we had spent nearly £20 on a ticket for. It was chaos, and needless to say I – and a few other people afterwards – were not happy with our experience in the slightest. So now, there’s two reasons I want to see David Gordon Green’s Halloween again – one, so I can see it with an audience who actually knows when to keep quiet and let others watch the movie; and two, this is actually a really great slasher movie that’s a warm welcome back to form for a series that has lost balance more than once in its lifetime. Taking place forty years after the events of John Carpenter’s 1978 horror classic, serial killer Michael Myers (played by original actor Nick Castle in some scenes, and by James Jude Courtney once he’s put the infamous mask on) is locked up and visited by a couple of British podcasters who are determined to get to the bottom of Myers’ reasons for killing the people he did that fateful Halloween night. Myers, as you can imagine, is non-cooperative, but then again neither is survivor Laurie Strode (Jamie Lee Curtis), who in the years since first confronting Myers has become an extreme survivalist, prepared for any possibility that Myers would escape and come after her once more – and escape he does, after a prison transfer bus carrying him crashes and sets him loose upon the world, returning to Haddonfield, Illinois to continue the merciless killing spree he started forty years ago. However, unlike before, Laurie is ready for him. This movie completely ignores all the previous sequels in favour of a timeline that connects only the first film to this one, though this is not the first time this series has stopped and restarted in such a dramatic fashion; after the dismal reception that the fourth, fifth and sixth films received, the continuity was revamped in the late 90s with Halloween H20: 20 Years Later, which featured a similar plotline of a traumatised Laurie Strode confronting Michael Myers many years after the fact. However, after that film’s 2002 follow-up Halloween: Resurrection collected some of the worst reviews of the series thus far, the series was rebooted with Rob Zombie’s remake which, aside from polarising fans and audiences, offered a more psychological approach to the development of Michael Myers which ultimately didn’t mesh with Zombie’s obnoxious and mean-spirited style. The interesting thing about David Gordon Green’s Halloween is that while it completely resets the continuity once more, it still takes into account all the things that the other films tried to bring to the series and improves upon a lot of them; gone is the divisive twist that links Michael and Laurie as brother and sister, as established in the first sequel Halloween II, as is any logical explanation for Michael’s madness because what makes Michael Myers so scary is that he just kills people for no good reason, and this film makes that look incredibly scary in some parts. There’s a tracking shot of Michael just going into random people’s homes and killing them without flinching, a thought and image alone that’s scarier than most shots in any other Halloween movie before it, and it’s so expertly done by Green who channels his inner John Carpenter – who executive produces as well as provides part of the score – so uncannily that you’d swear this was almost a brand new film made exclusively by the legendary horror filmmaker. 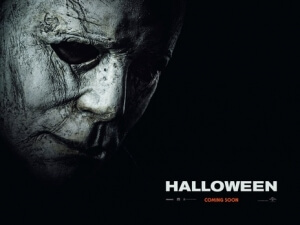 It offers fans a better version of what they’ve always wanted to see, that being a thrilling final showdown between Michael Myers and Laurie Strode, than Halloween H20 ended up pulling off, because this one actually feels like a direct predecessor of the original whereas H20 looked and felt like a movie made right off the success of Wes Craven’s Scream. Plus, it’s got an incredibly satisfying role for Jamie Lee Curtis as Laurie this time round, as someone who’s become so obsessed with confronting the past that she’s neglected to be a caring mother and grandmother in the present; there are shots that cleverly call back to ones from the original which involve Laurie, which raise the interesting question of how, or if, one monster has created another. It’s a clever script that has a strong payoff at the end, and gives Laurie Strode an ending that’s far more fitting for her character than the unceremonious and insulting way her character was killed off in the opening of Halloween: Resurrection, not to mention gives us an enthralling and tense battle between two people who are, in their own way, hungry for blood. There are some effective kills in this as well as some seriously spooky shots of Michael Myers just standing or walking in the background, which make it not just a very good Halloween film but also a well-made and endlessly entertaining slasher film, which I hope to God the next time I see this isn’t ruined once again by obnoxious audience members. Halloween is a satisfying and entertaining reset of the entire series which contains some effective kills, smart call-backs to memorable shots from other films, and a pulsating final showdown between Laurie Strode and Michael Myers.